Paule Gobillard, a Post-Impressionist painter of the French School, was born in Quimperlé, Brittany, in 1869. She was the niece of the Impressionist painter Berthe Morisot, who painted at least ten portraits of her. She grew up in the presence of Morisot and her husband, Eugene Manet, brother of Edouard Manet, as well as Renoir, Degas, and Odilôn Redon. She was painted by Degas twice (an oil and a pastel, both now in the Metropolitan Museum, NYC), and by Odilôn Redon (private collection). To those familiar with Impressionist works, Paule is well known, even from childhood, in Morisot’s “Woman and Child on the Balcony,” with her well-worn high top shoes and white apron, peering out over the balcony awaiting the evening car. 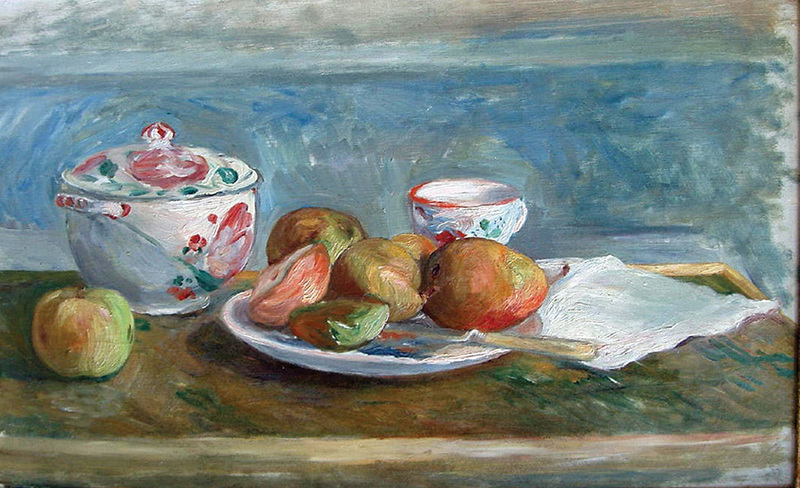 From her youth, Gobillard painted with her aunt, Berthe Morisot, from whom she learned the disciplines of oil and pastel (the latter bringing much praise from the hard-to-please Degas). Upon Berthe Morisot’s recommendation, Paule studied painting in the atelier of figure painter Henri Gervex (1852-1929). Morisot also encouraged her to spend time in the Louvre studying the old masters. Paule made several quite fine copies at the Louvre; but her faithful copy of Titian’s “Concert in the Fields” represented a feeling present in all her future work. Paule spent much time at Mézy, where Eugene Manet and Berthe Morisot had a country house. She painted in the gardens alongside her aunt. While in Mézy, she executed a number of very beautiful pastels, characterized by the typical light found only in the lIe de France, and by the subtlest use of color graduations. Following the death of her parents and later her aunt, Paule and her sister Jeannie, lived with their cousin Julie Manet under the guardianship of Pierre August Renoir They lived at 40 rue de Villejust (today called rue Paul Valéry) in the house built by Morisot and Manet. There they were surrounded by the greatest painters, and one of France’s most famous poets, Stéphane Mallarmé, who was Julie’s tutor, as Renoir was Paule’s. They also often visited the Renoir family in Normandy at the village of Essoyes. In 1906, Paule Gobillard became a senior member of the Salon d’Automne, where she exhibited regularly. She also exhibited at Durand Ruel, Petit Druet and Galerie Bernbeim Jeune. She was part of a group that included D’Espagnat, Maurice Denis, Vuillard, Bonnard, Marquet and Valtat. She was also a close friend of the art critic Felix Fénéon. She exhibited in Japan, the United States and Denmark. During all her trips, Paule continued painting using living models during concerts and lectures and sometimes depicting them with a caustic sense of humor. Paule Gobillard died in Paris in 1946 at the age of 77, after a long illness. In 1948, the poet Leon-Paul Fargues wrote a very eulogistic article on her on the first page of Figarounder the heading, “The Friend of Painters and Poets.” The same year, D’Espagnat wrote the preface to the catalog of her retrospective exhibition at Durand-Ruel.